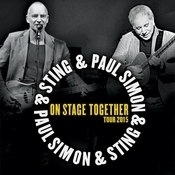 Sting.com > News > Can't Stand Losing You: Surviving The Police - Coming to theaters starting March 20th! 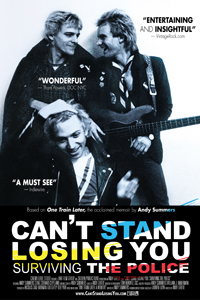 Based on the acclaimed memoir One Train Later by rock guitarist Andy Summers, Can’t Stand Losing You: Surviving the Police follows Summers' journey from his early days in the psychedelic ‘60s music scene, when he played with The Animals, to chance encounters with drummer Stewart Copeland and bassist Sting, which led to the formation of a punk trio, The Police. If you’d like to keep up to date on news regarding Can’t Stand Losing You, including screenings, giveaways and more, follow them on Facebook, on Twitter @asummersmovie or visit the official website. Also follow Andy on his newly created social media pages as he prepares for the release for his much anticipated film release. Facebook | Twitter | YouTube | Instagram | Google+ | Spotify | iTunes.